Weigela Florida is the June 2017 Plant of the Month – Glacier View Landscape and Design, Inc.
JUNE: WEIGELA -Weigela florida is a common plant species used in horticultural landscapes throughout the US and Europe. Originally from eastern Asia, North China, Manchuria and Korea it discovered and brought to Europe in the mid 1800’s. Most shrub varieties range from less than 2’ tall to 15’ tall, though the species generally planted in Boulder Colorado landscapes are usually not larger than 6’ high and wide. 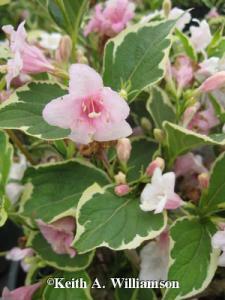 Anywhere from green to burgundy to variegated leaves are prolific on the plant. Flowers are more cone or trumpet shaped and can be profuse. They tend to bloom most of the summer which make them more attractive than other flowering shrubs which tend to bloom once then lose their flowers for the remainder of the summer. It requires regular and medium moisture so it is not best suited to the dry and arid xeric landscapes of some Front Range communities, but in the right spot, with a little extra moisture, or in a low lying area that collects natural moisture, Weigela will thrive. 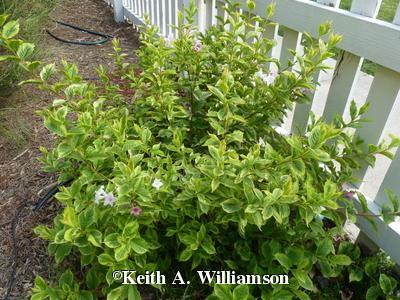 Weigela needs little pruning, though when first planted, they can often die back to the base of the plant and begin again from the root stock in the spring. So, sometimes winterkill needs to be pruned away to make room for new growth in the spring. Flowers range in color from red, to burgundy to pink. 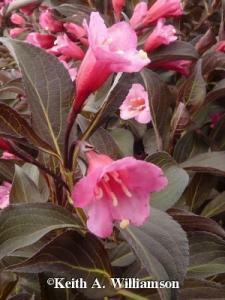 If planted in the right location and given adequate moisture, Weigela will be a show stopper. Plant 3 or 5 on your property today!